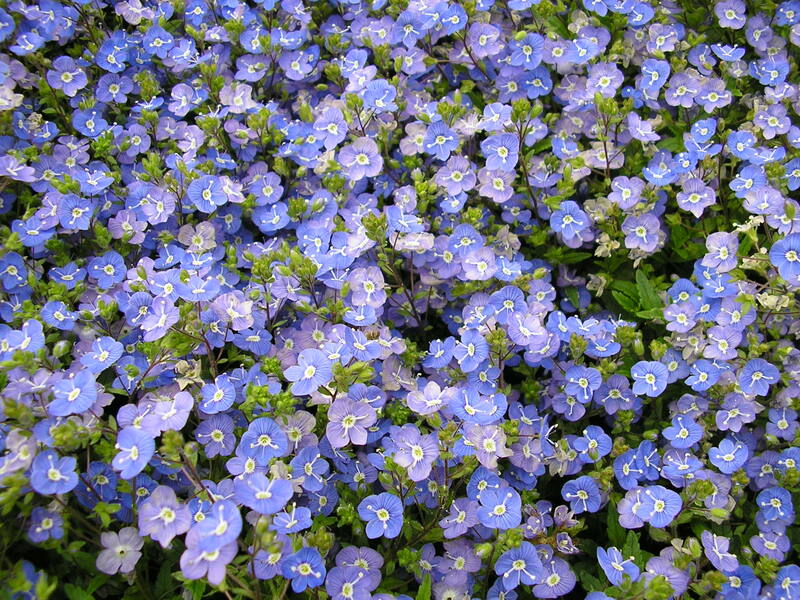 How deeply can you look into the blue of these ‘Georgia Blue’ creeping veronica blossoms in early spring? What do you see? What memories does the blue evoke? How deep will you go into the woods on such a day? What is out there for you to discover? This entry was posted in Gardening, Nature, Weekly Photo Challenge and tagged Camellia japonica, Georgia Blue, Magnoliaeflora, Veronica 'Georgia Blue', woods. Bookmark the permalink. Thank you, Cynthia. It’s one of my favorites. Gorgeous. I need that Veronica. Thanks, Jason. there are two creeping veronicas I have in the garden. Georgia Blue, really a bit more electric and deeper blue than in the photo, and Waterperry, a light, pale blue. Georgia Blue blooms earlier than Waterperry and spreads more quickly. Both are hardy here in zone 7, although Waterperry needs a bit of cleaning up in the spring. I hope you can find them and they can survive in your zone; they are great ground covers. Nice choices! A beautiful snow scene, and reminders of spring to come. Thank you. 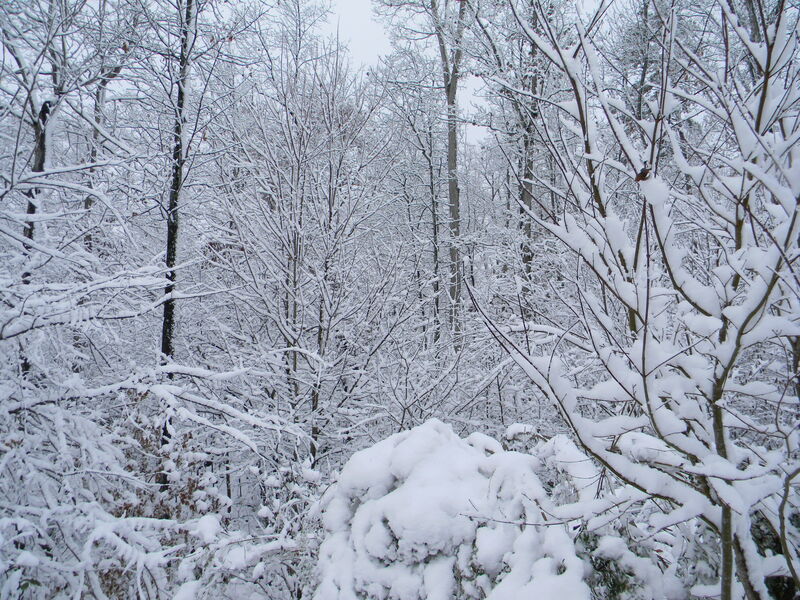 We don’t get much snow here, so I have to grab the camera quickly when it does. Some winters we don’t get any snow. It’s nice to look at for a day, and it’s nice to see it go. Thanks, Cathy. Be careful in the icy part. Camellia japonica ‘Magnoliaeflora’ is a real charmer. Thank you, Marian. 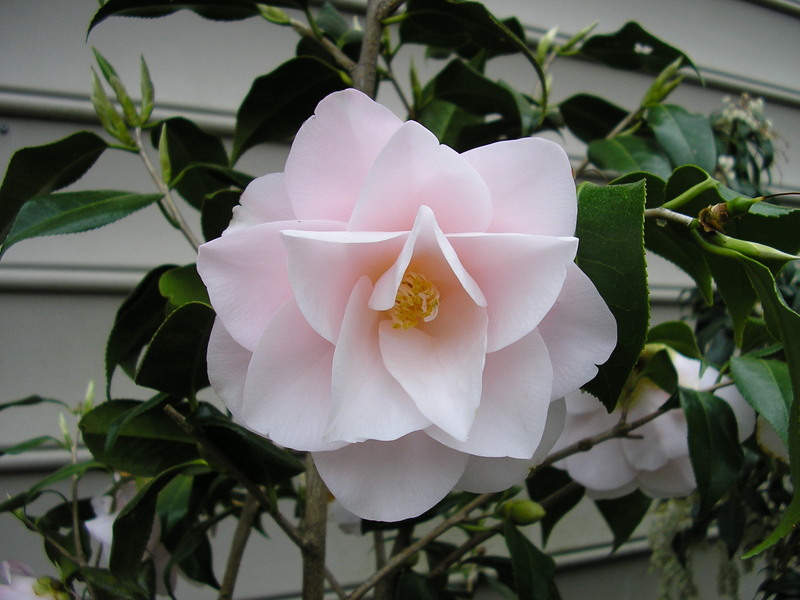 It is my favorite camellia. Beautiful all of them. That Veronica is gorgeous. Thanks, Leya. It’s a great ground cover. What lovely pictures! I don’t have those veronicas in my garden but the color reminds me of carpets of bluebells in the spring in England. Thanks, Liz. As you can see, it is a favorite ground cover in our garden. I love the snow scene and miss the snow a bit. It is funny you asked how far one would go into the woods. Where I am now, we went deep into a bamboo forest and easily could have gotten lost. Every stalk of bamboo was the same on a two foot wide path. Enjoy your trip, Donna. I am looking forward to your photographic report. Love this new post of weekly photographs. These three, and your reflection are lovely. Thank you, Stepheny. I sense that this weekly photo challenge will become a mind bender in the future. Fun! Thank you, Cathy. I’m just getting into the weekly photo challenge…and it is a challenge. I’m sure there will come a day when I draw a blank.